Corrosive chemical storage is considered either a liquid or solid that can potentially cause visible damage or irreversible alterations to human skin tissue, after immediate contact. In this article US Chemical Storage illustrates corrosive classifications, how to evaluate corrosive environments and examples of commonly used corrosive substances. Corrosive chemical storage building by US Chemical Storage offers increased safety and full compliance for storing corrosive substances. Industrial processes that utilize corrosive materials include battery manufacturing, electroplating, chemical syntheses, metal cleaning, metal etching and electrolysis. The risk of exposing workers to corrosive materials should be clearly identified and evaluated; prior to handling, transporting or storing. Liquid corrosive materials are those with a pH of four or lower and a pH of nine or higher; solutions are both capable of causing chemical burns. The severity of the burn is dependent primarily on the concentration of the corrosive chemical and the duration of chemical contact. Corrosive vapors, fumes or mists can result in respiratory damage if inhaled, as well as causing serious burns and irritation to the skin or eyes. Corrosive chemical storage environments should be maintained with mechanical ventilation and gas sensors or evaluated with air sampling conducted by an industrial hygienist or a highly trained safety professional. Be sure to have Material Safety Data Sheets (MSDS) on hand to analyze each chemicals’ hazard classifications, prior to handling, transporting or storing corrosive chemicals and/or other hazardous materials. Employees who handle, transport or store corrosive materials must always wear personal protective equipment (PPE). Equipment including acid-proof suits, face shields, gloves and shoes should be worn before handling any type of corrosive material. Learn more about corrosives and other chemical classifications here. 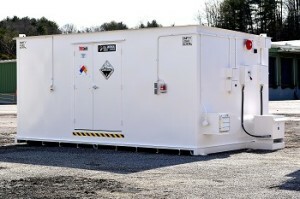 Are you prepared for storing corrosive materials? Contact US Chemical Storage online or call 888-294-2729 to learn more about corrosive chemical storage buildings and how to remain fully compliant when storing hazardous materials.